The EverPure OW4-Plus water filter inhibits scale buildup in water-using appliances with KDF media. The Everpure OW4-Plus delivers quality water ideal for bottleless water coolers and drinking fountains. The Everpure OW4-Plus submicron filtration cartridge provides sparkling, fresh, premium quality drinking water. The EV9635-01 OW4-Plus replacement cartridge features Everpure's unique filter blend using activated carbon which reduces chlorine taste and odor and other offensive contaminants. Precoat submicron technology reduces dirt and particles as small as 1/2 micron in size. The Everpure OW4-PlUSFilter cartridge reduces health contaminants such as cryptosporidium and giardia cysts. The OW4-PlUSFilter provides bacteriostatic control and reduces microbial growth. The Everpure OW4-PlUSFilter reduces lead to below the Federal Action Level of 10 ppb. The Everpure OW4-Plus sanitary cartridge replacement is simple, quick and clean. Internal filter parts are never exposed to handling or contamination. NSF Certified under NSF/ANSI Standards 42 and 53. Note: The lead claim is only valid with the use of fitting with flow control at 0.5 gpm (p/n EV3081-32). 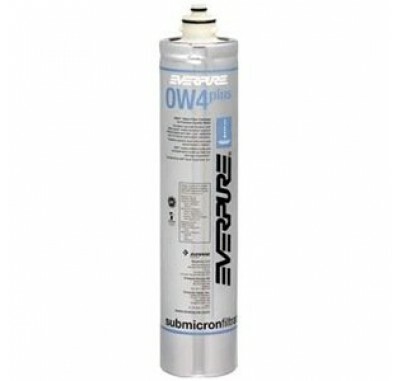 Replace the Everpure OW4-Plus Filter Cartridge every 2,000 gallons.